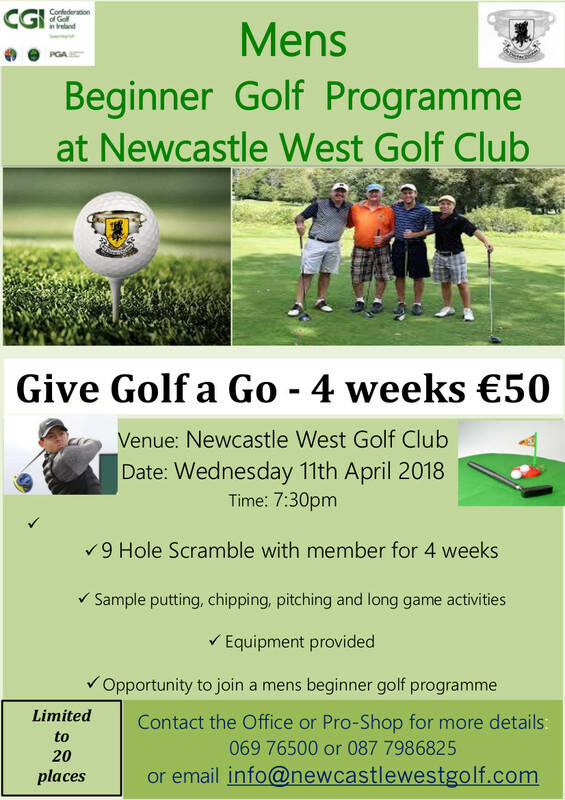 Newcastle West Golf Club in conjunction with the Confederation of Golf in Ireland are running an initiative to introduce Men to golf. The sessions will last no more than 1.5 hours per week, which means there is no reason for Men to miss out on the fun! This is a great opportunity for Men of all ages to give golf a try through a selection of fun activities. Please pass on this information to any man you feel may be interested. 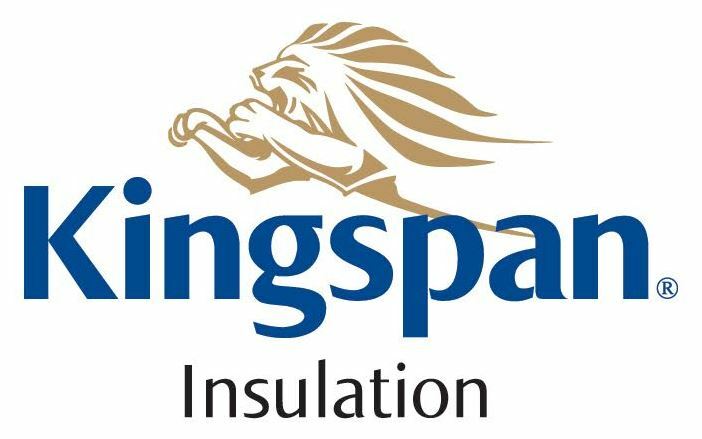 The total cost of this programme is €50 which can be paid on the first night. Neat casual comfortable clothing will be suitable for the lessons. Be aware that it can get chilly on the golf course, so bring something suitable for the weather conditions. If you do not have golf shoes you can wear runners/trainers. No, all equipment needed will be supplied for the lessons. However, if you have clubs you should certainly bring these along. I am already a golfer. Can I apply? No, This programme is to encourage complete beginners who are looking to learn the basics or support men who are returning to golf after a long period of time away and are looking to start at the most basic level. Do I get a handicap? No, In order to get a handicap you would need to be a member of a club and return 3 scorecards, as this is a beginner’s programme you would not obtain a handicap. 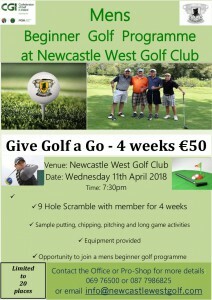 Please contact the Club Office by emailing info@newcastlewestgolf.com or phone 069 76500. We will be happy to answer any queries and assist in your application for the Get into Golf project.